CeraVe Moisturizing Lotion provides all-day moisturization with a single application and is clinically proven to increase skin hydration. CeraVe Moisturizing Lotion is uniquely formulated to increase the skin’s ability to attract, hold and distribute moisture. It penetrates deeply into the stratum corneum (the skin barrier) to restore the balance of essential lipids. This helps keep the skin barrier intact so it can protect against outside irritants. 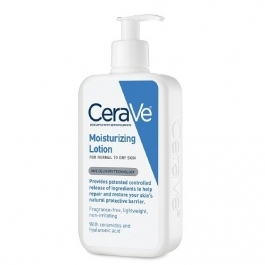 CeraVe Moisturizing Lotion also forms a protective layer over the skin’s surface to help prevent moisture loss. Ordinary moisturizing lotions need to be applied frequently because the ingredients are released in a single “burst” and absorbed in a short period of time. Like all CeraVe Skincare products, CeraVe Moisturizing Lotion has the advantages of patented MVE delivery technology, which provides a controlled release of essential ceramides and other skin-nurturing and protective ingredients slowly over time. It allows the ingredients to penetrate deeply into the skin to moisturize and nourish skin throughout the day while “locking in” precious moisture. The unique ingredients in CeraVe Moisturizing Lotion help restore and maintain the natural protective function of the skin barrier, help restore damaged skin, and help keep skin healthy. CeraVe Moisturizing Lotion spreads easily and smoothly, absorbs rapidly, and never feels greasy. It is ideal for larger areas of the body. Like all CeraVe Skincare products, CeraVe Moisturizing Lotion is noncomedogenic (does not cause pimples or acne by clogging pores), non-irritating, and fragrance-free. A mild irritation or rash may occur on sensitive skin with initial use. If irritation or rash continues, discontinue use and consult a physician.